Popular restaurant, Watkin's Grill was housed here for decades. 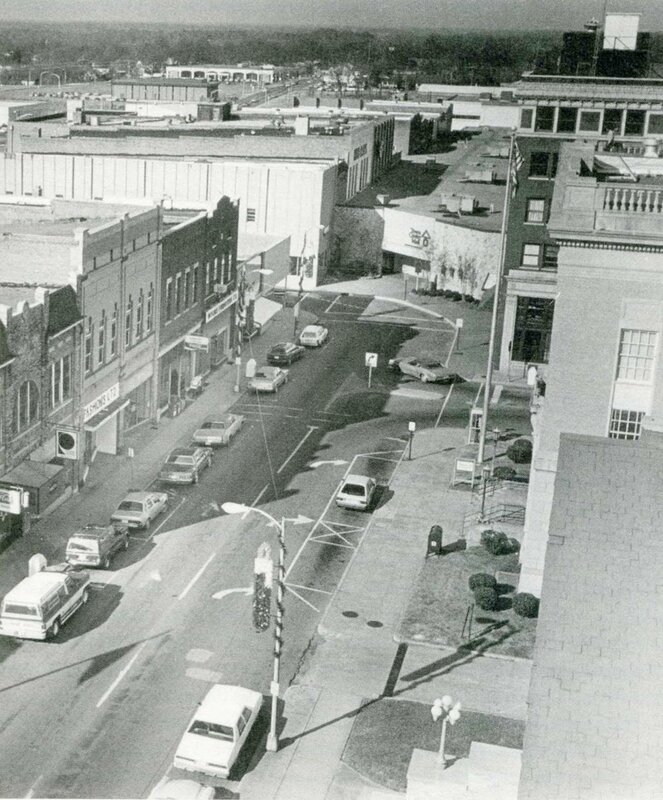 East Main Street during the period the Town Center Mall closed off Main Street. In 1859, an item in the Indian Land Journal, Rock Hill’s first newspaper, reported the purchase of these lots by Jonathan N. Steele in January of that year. Steele is thought to have gone into business with William B. Fewell. Little is known about this, except that Fewell deeded his half interest in the property to Steele in 1868 for $1,200. Later that year, assignees of Jonathan Steele deeded the lot to Ferguson H. Barber. In the late 1870’s or early 1880’s, Ferguson H. Barber, a local merchant, built a new residence here. The house had an elaborate two-story structure featuring a very spacious wrap-around porch and gingerbread trim. Barber owned the Manetta Mills in Lando, S.C., as well as businesses in downtown Rock Hill. He was known to drive a buggy to work each morning, and return in the afternoon, a round trip to Chester County of approximately forty miles. His home stood till about 1910, one of the last homes torn down to make room for vehicular traffic and new businesses from the corner of Hampton, stretching east to this location. Around 1919, the People’s Trust Bank acquired the old Barber lot, dividing it into four parcels. A filling station was put on part of the land, later to become a florist - Kimball's Flower Shop. In the 1930s, the remaining parcels further dividied into retail space and used for a dress shop, a series of furniture stores and Watkins Grill. The most recent occupant was Bea’s, in the 1980’s, and an establishment known as Scottie’s. In 2017-18, the Friends of the Library took occupancy of the space to operate their retail book sales.